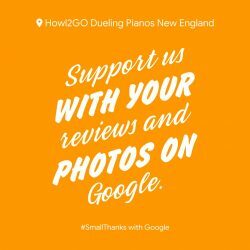 Read verified Google reviews of our amazing New England Dueling Piano shows, and then contact us to book! Loved working with the team! Howl2Go was professional, incredibly talented, and very in-tune with the crowd and the vibe of my party. They were so easy to work with from booking to the last note. I would definitely hire them again. Dan and Polina were super pros and Melissa and Wesley ran a great show!! And the guests LOVED it! Our song requests ranged from Gangsta’s Paradise to Aladdin! It’s a great addition to any party – don’t think twice BOOK THEM! There are lots of Dueling pianos to hire but don’t make this mistake. Howl to Go was the best show I could ever ask for. Been to Howl at the Moon many times and these performers was just what I was looking for. Dan was amazing and I remember seeing him at the Foxboro Massachusetts location. I felt lucky to have him! I am so happy this was recommended to me! I was definitely skeptical at first when booking dueling pianists for a company holiday party. Everyone was on the dance floor the entire night and people are still raving about the band almost a week after the party. I will book them again and again – they will impress your audience and cater to your liking! Super easy to work with. Five stars. Can’t say enough good things about them!